"Hi, I'm Joe Johnston- I live in a small town named Bo'ness, famed for being Scotland's first racing venue- the Bo'ness Hillclimb. Which is now up and running again, having closed in 1966. In 1959, Jim Clark drove his Elite at the event. I remember it too well... or at least my wife keeps saying. "Too much money on Lotuses! ", she screams." "In 1972, at 17 years old, I got my driving licence, bought a Ford Anglia- first thing I did was out with the 1200 motor, in with the 1500GT. (Getting the idea now?) Second car, a Mk1 GT Cortina red 4-door... then many other models of mk1s. Threw my hands in at the oval stock car racing. I raced there for a few seasons. 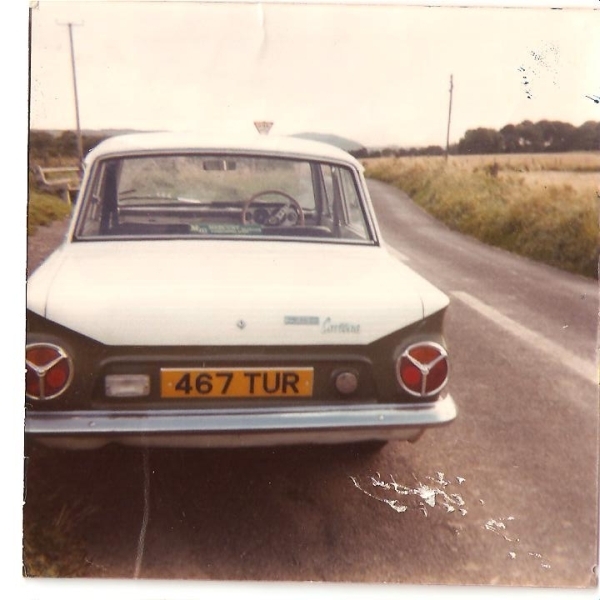 I was working on my GT in approximately 1977, when a young guy approached me, desperate for a hundred quid, as he had bent a wing on his Pa's new-ish, mk3 Cortina. What had he to sell me?, I asked. "A Lotus Cortina". Now at that time, I had never seen one apart from mag pics. The car had a 1600 xflow fitted. Deal done. That was 467 TUR. A few weeks pass, and a mate from England arrives- "I like the Lotus", he says. "Proper engine fitted?" "No..." I said, "He wanted another 50 pounds for it". I then went and got the engine, sent it to QED, for race-spec engine-build. Very fast- too torquey with the long first gear. I removed the A-frame rear suspension and fitted a GT one. I sold the car about 1979. It went to Wales and was stolen there. Never recovered, as far as I know." 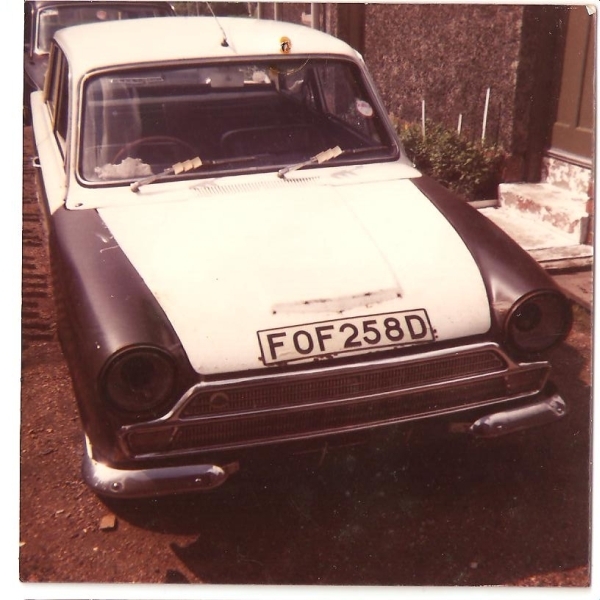 "My 2nd Mk1 Lotus Cortina was about 1981, and was a 1965 aeroflow model. Bought it for 1k in Preston,England, reg FOF 258 D. Standard Lotus car. It was OK, but not a patch on 467. Kept it about a year and sold it back to England." "My third was a 1966 model, bought in approximately 1985. That was CSW156D. The shell was scrapped, I bought a red GT 2 door and re-shelled CSW. It got sold quickly to a guy 10 miles away in Larbert, who never kept in touch. (And ironically, the car has turned up last year, now here in Bo'ness! It's in primer- I'll go get pics)." 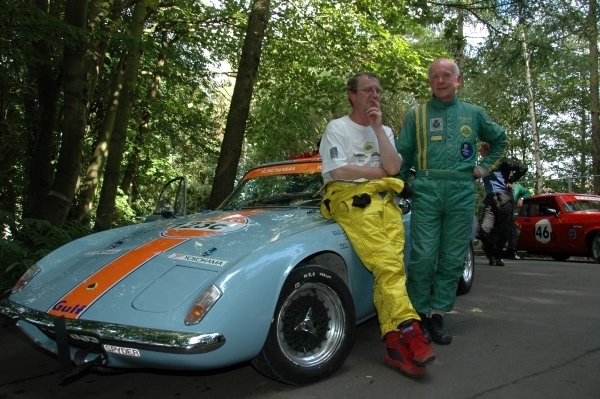 "I then owned 3 mk2 Lotuses. I forget the reg numbers, apart from the one in pic below. That was a genuine factory black one. Used it daily for a year or so. Sold it in about 1989, and bought an XR3." "Big gap here- jump forward to 2006. I bought a Plus-2 and raced it. Bought a Europa s2, built it to road spec, sold it on. Then an s4 Elan in Gold Leaf colours. Concours. No good to me, it was too good to race. Then in November, I buys a Europa Special from Jim Clark's cousin's garage in Duns, 200 yards from the Great Man's grave. Got it home. FAR too good for me to ruin. I didn't know it was a one-owner. Now get this- a friend is buying a Plus-2 from someone, I don't know who... its to be delivered to my garden- and when it gets arrives... it's the guy who sold me CSW back in the '80s! He likes the Europa... 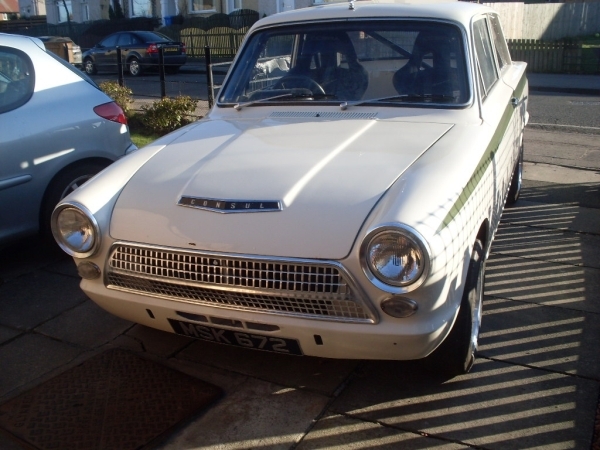 I gets a Mk1 Consul Cortina, plus a pile of his cash to buy parts for it! So in a 2 month period, after a 20-year break, I buys a Lotus from Clark's cousin, (Doug Nivens Garage), I meets the original owner of CSW and that same CSW turns up back in Bo'ness, and I ends up with a car similar to what I started with as a 17 year old kid! " "Some of us never grow up. Phew! All my own writing as well. Good day sport!!! 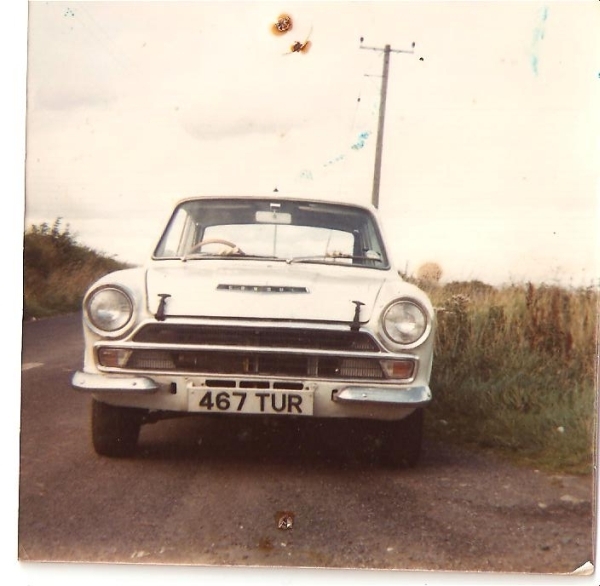 I was also a founder member of both the Lotus Cortina Register, and the Ford Pre-67 Club, (but I don't keep in touch now.) I am an active member of Club Lotus and Lotus Drivers Club, LDC. Think they'll kick me out for having a GT? He He!!" "look at 467... that was 1979, ,modern plates etc. The badge on the rear of 467, is a "twin cam" badge. Remember, it was the 70s, so we played with things. Its what we done then- now I'm trying to make them look older." "This is a pic of FOF258D- This is in 1981, I had just sold 467TUR, and was having withdrawal symtoms. 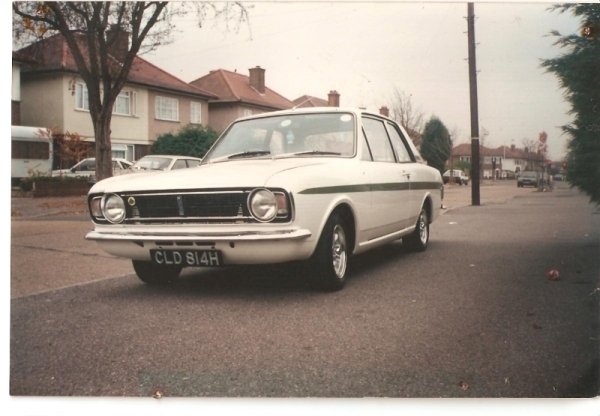 2 kids came along, and "Bye bye, Cortina..."
"This is one of my many mk2s, pictured after I had sold it. This car was actually factory black when I owned it..."
"p.s. I'm the guy in the yellow suit. And in the green suit, that's Jim Grant from Larbert, Scotland. A top Elan driver, also correspondent for the LDC, mag CHICANE." Joe will be racing a 1963 Cortina MKI in 2010.